Editor’s Comment/ This software increase energy, stop cravings, and end the need to diet ever again, well, that’s most of us, right? it is and the Weight Loss Screener video ecourse is a breath of fresh air from the dry ebooks and articles you’ve been reading. 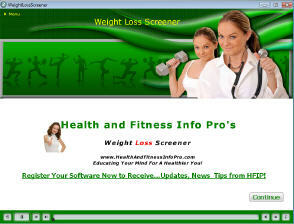 Watch, listen and learn as the Weight Loss Screener educates you on the real science behind safe, effective weight loss and proper nutrition. Don’t miss this life changing information.